Ep. 72: Carey Green – Live. Build. Change. | Aimee J. What matters most to Carey Green is that his life matters – not just now but for eternity. He's working hard everyday to ensure that his life does matter, in a variety of ways. Carey is a retired pastor turned entrepreneur. He's built and runs Podcast Fast Track, a company that provides professional audio editing and production and SEO rich show notes, has created a couple of online video course, is author of 9 books on topics ranging from Christian growth, to business mindset, to fiction. His most recent project is launching January of 2017 – Live Build Change – a project aimed at helping Christian men and women LIVE an authentic Christian faith, BUILD a business (part time or full time), and CHANGE the world by integrating the two. It's his dream to make his life matter by equipping others to make their lives matter for eternity. Can a singular pursuit hold you back? When most Thought Leaders preach singular focus on one dream or passion, some leaders push back at that idea. Carey Green is one of those leaders. He has learned that some people are wired to pursue multiple passion projects. Carey counts himself among them. He points out that Thought Leaders who teach about singular focus do so fervently because it's worked for them. Carey is challenging the idea that one size fits all. He wants to open up business leaders’ perspectives to see more opportunities for growth, not less. To hear more from Carey, make sure to catch THIS episode of Chasing Dreams! Have you ever thought deeply about your legacy? What will you leave behind when all is said and done? As the New Year approaches, people often think about how to change or make an impact on the short term. But Carey Green has his eye on a different prize. Carey wants to make an impact that will live on long after his time on earth has passed. He wants to make a difference for eternity. Carey comes from a background in Christian ministry. His faith has fueled his latest passion project. Carey is launching a new endeavor called “Live.Change.Build.” Its focus is to equip Christian men and women in their pursuit of a stronger faith, a growing business, and creating an impact in their world. To catch more of Carey’s vision, listen to this inspiring episode of Chasing Dreams! Have you ever been in a “Funk?” Has there been a time in your life where you just couldn’t figure out the way forward? How do you navigate your way out? Carey Green was in the middle of putting together a new project when he hit his “Funk.” He learned some important lessons in this season and how to make it out on the other side. First, he learned the necessity of letting others in. Carey shared his thoughts with someone close, his oldest son who works with him. That made a huge difference! Second, Carey focused on the clarity he had before the “Funk” set in. 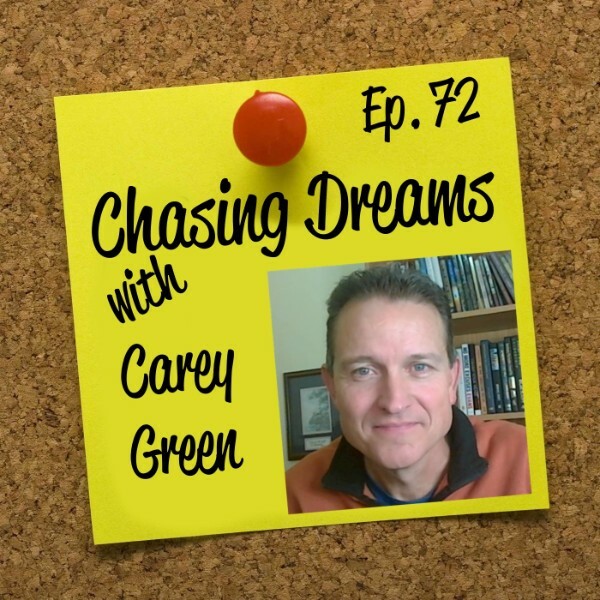 He calls it “Never doubting in the dark what you clearly saw in the light.” Hear Carey expand on these thoughts and more on this episode of Chasing Dreams! How do you weigh success? Is success always something you weigh by the numbers? What if there is a different way to gauge your impact? Carey Green is rethinking what success looks like. Carey is an entrepreneur so he’s a numbers and business guy at heart. But even deeper than that, Carey is a man of faith. It’s his faith that motivates him to look differently at success. He launched this new project to make a difference in the lives of others and to change the world. Carey wants to see his life influence others for eternity! To catch a view of success from a different angle, make sure to listen to this episode of Chasing Dreams! [1:10] Aimee’s introduction to this episode with Carey Green. [3:22] Carey talks about his career in Christian Ministry. [4:39] What came next for Carey after retiring from ministry. [11:27] How Carey got involved with the Podcasting industry. [13:29] A new dream emerges for Carey. [15:36] Can a singular pursuit hold you back? [16:37] Live. Change. Build. – Carey’s latest project. [22:20] How do you weigh success? [26:13] Aimee and Carey discuss appealing to an audience. [33:13] How does Carey prepare for the New Year? [35:46] Carey’s one piece of advice for people who are chasing their dreams. Be flexible. We tend to think that sitting down, making that plan and knowing every step of it is the answer. But that’s not the answer. Often our vision of what the dream is going to look like is not what it is really going to look like in the end. We don’t see the future clearly. We just have an idea really. As you are on the path, and you are approaching the consummation of that dream, be flexible.